Our guide will meet you and organize your transfer from Maumere airport to the harbor and boarding on the Ombak Putih. For those who may have arrived the previous day, in the morning after boarding the ship we will tour the small village of Watoblapi to enjoy a village dance and see a demonstration of their local traditional weavings. Watublapi is a small community in the Sikka district well known for its fine traditional ikat weaving. Whereas many other local weaving communities switched to industrially spun yarn and chemical dyes for the sake of saving time and money, the weavers of Watublapi still use the traditional, handspun yarn made out of local cotton, as well as local natural dyes. When all voyagers have arrived and settled in their cabins, we will weigh anchor and navigate the Cape of Flowers (Cabo de Flores), so named by a Portuguese expedition crew in the early 16th century, and head for the port of Larantuka. Enroute, we are certain to enjoy a first swim and snorkel in these beautiful waters. In the morning we will moor close to the town of Larantuka, the capital of Flores Timur and a central hub for early colonization and Catholic clerical activities. There we will see the five Catholic Churches and the ‘Stations of the Cross’ built along the waterfront. Later we will cross the Flores Strait and visit the village of Lohayong on the island of Solor, a lot of the villagers here make a living by processing sea salt. The process is seasonal, but with a bit of luck we will be able to witness the process. After that we will visit the ruins of Fort Henricus built by Dominican Friars in 1566 to protect their spiritual work from enemies. Early Portuguese sandalwood traders left this task to the missionaries. The fort was later captured by the Dutch East Indies Company. 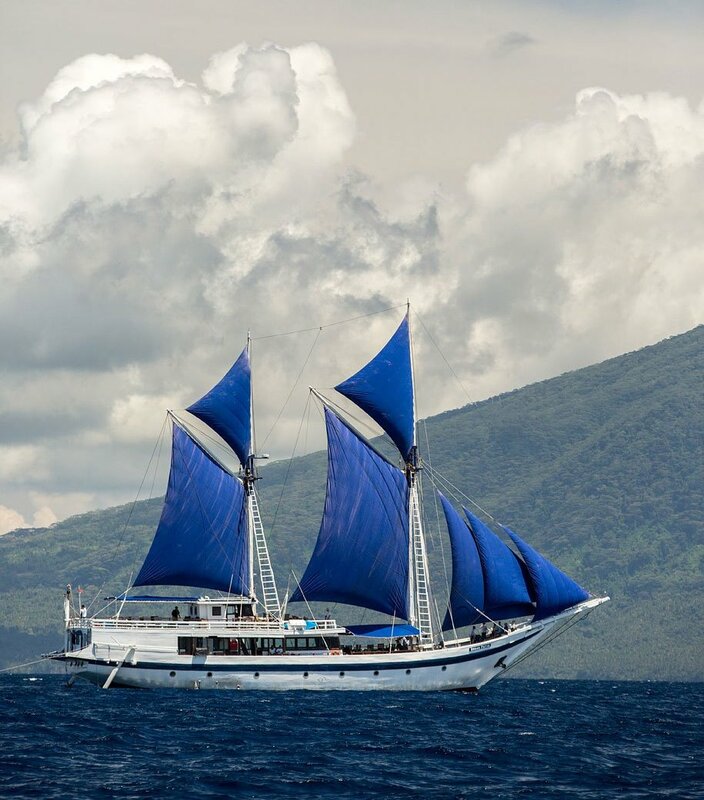 Back on the ship we will have a beautiful sail through the Solor Strait with the Lili Boleng volcano on the island of Adonara as backdrop as we as we navigate to Lembata Island. As always, we will work to plan time to stop for a swim and a snorkel. 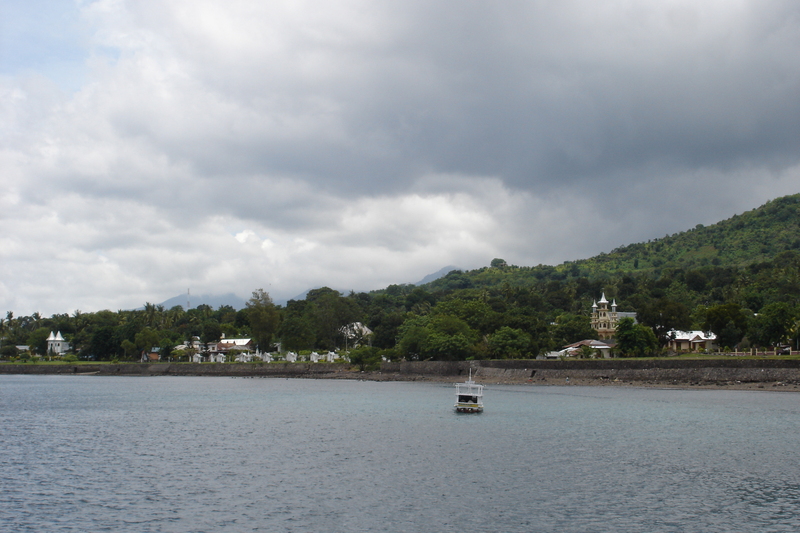 Today we arrive in Lamalera, island of Lembata, which is one of the two remaining whaling villages in Indonesia. Bordering the Timor Straits, the village is in an area long recognized as hunting-grounds on the nineteenth century British and American whaling voyages. Since at least 1836 these villages have taken various species of whales and yet today, these traditions remain available to observe. On the beach we will see the small craft for the hunting of the sperm whales and perhaps preparation for their hunt if whales are in the vicinity. This small-scale hunting (no more than 25 per year) is considered sustainable, and the local economy has some dependency upon it. We might join a short sailing on of one of the boats, admiring the harpoonist standing on the edge of the bowsprit. In the afternoon, we begin our sail to Alor. 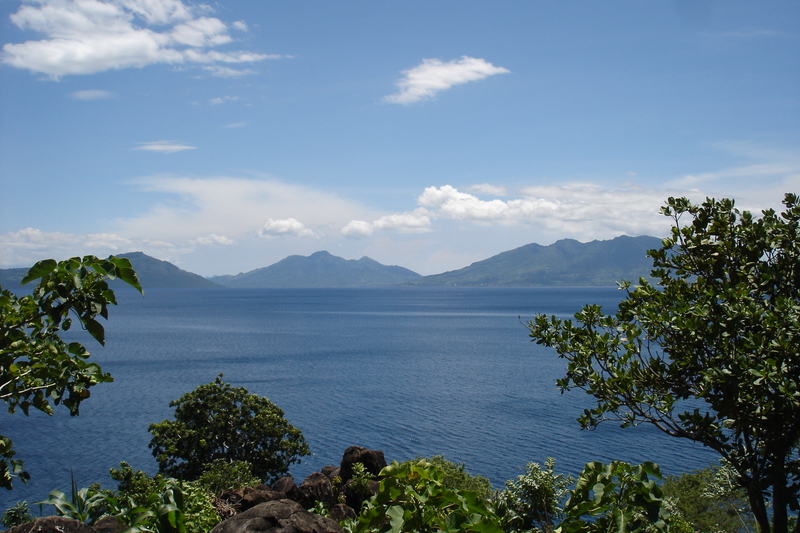 The bay of Kalabahi on Alor is enchanting in the morning. We will visit a traditional village in the mountains where we may witness a war dance around the mesbah, the ritual center of the village. Here we will see the moko drums, which for centuries have been part of a wife’s dowry as well as played for New Year celebrations and are thought to originate from Indochina. 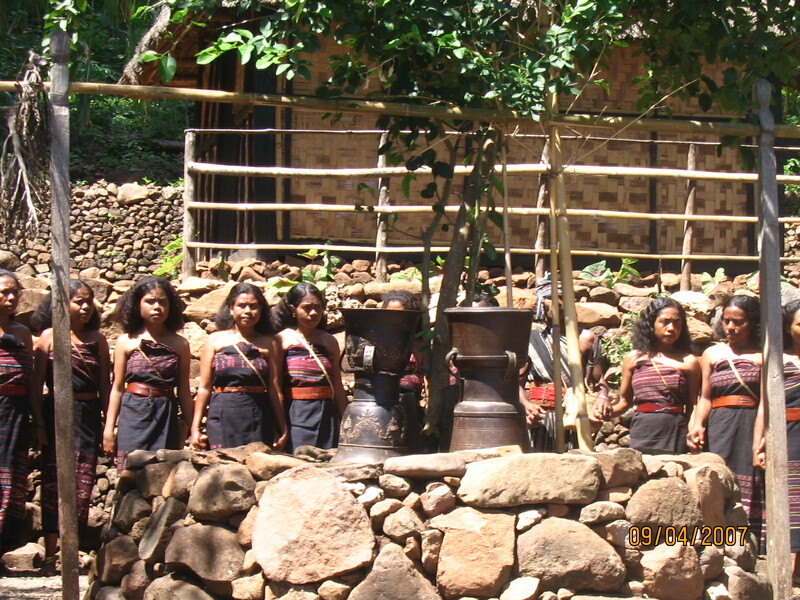 Alor produces Ikat cloth famous for its intricate patterns and bright colors. In the evening we will proceed further to the east and the western Daya Islands in the southern Banda Sea. 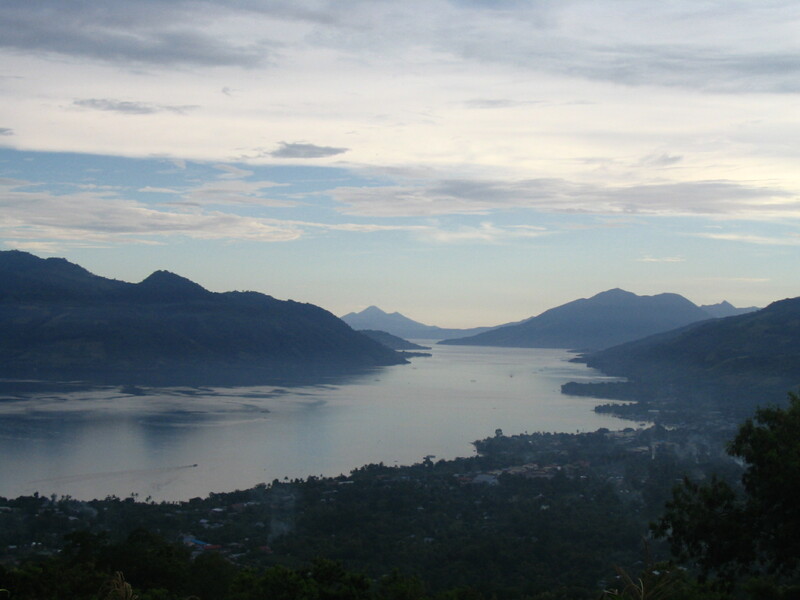 Today we cross between the Lesser Sunda Islands group and the Moluccas of the region known as Maluku. The first Moluccan island we will enounter is Wetar. We will anchor here in a delightful bay. The island appears virtually impenetrable from the sea. It and close by islands comprise part of Wallacea, the area of deep water separating the Asian and Australian continental shelves. We will find fishermen drying their catch on the beach, great swimming/snorkeling and visit local villages. 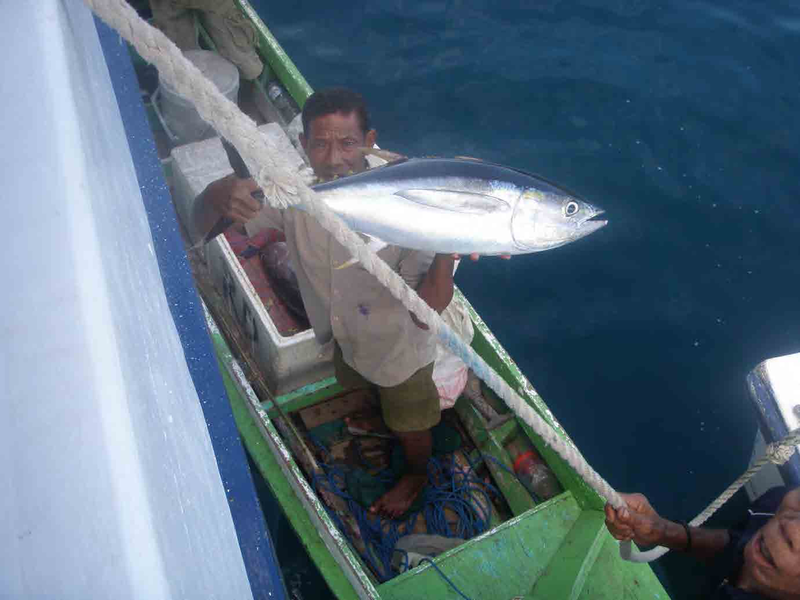 In the evening the captain will set the Ombak Putih on an easterly course towards Romang. We will awaken off the island of Romang. After our breakfast gathering on the deck we will have a chance to trek around the island. Back on the boat we will have lunch while we sail eastward to the tiny island of Mapora here we spend the rest of the afternoon snorkeling and beachcombing. In the morning we will reach Damar, the next island in the Ring of Fire chain. This island, volcanic in nature, was one of the few islands outside of the Bandas that produced nutmeg. All the trees were destroyed by the V.O.C. in 1648 to further monopolize the spice trade. We will visit a small village consisting of simple huts made from leafs of the sago palm. Staple foods of the locals are sweet potatoes (ubi), bananas and fish. We will pass four spectacular volcanic islands virtually standing alone and jutting from the clear blue ocean. Known as stratovolcanoes, meaning built up over successive millenniums of periodic eruptions, they express a quiet beauty for us to enjoy. We will make a stop at Serua, the last in this extended chain of volcanoes. It is home to one of the few villages in the chain. If time allows we visit to experience their remote lifestyle. 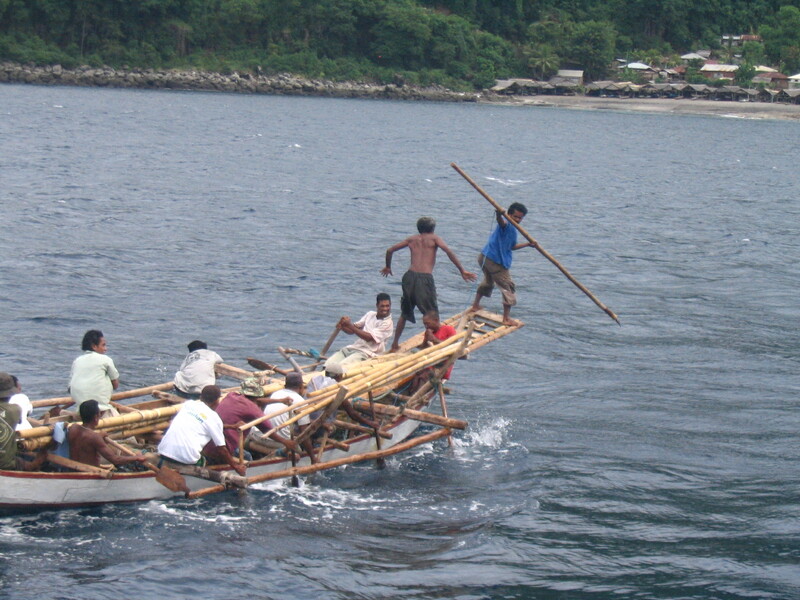 Since the eruptions in the sixties and seventies, many of these island populations have migrated to other islands in the Moluccas. Today, we also reach the small island of Manuk which is uninhabited by humans but truly a bird and marine sanctuary. Frigate birds, gannets and other marine birds have their nests in the trees. If the tide allows, we will make a landing and go in for an up close look at the birds and wildlife. In the late afternoon we proceed towards the Spice Islands. 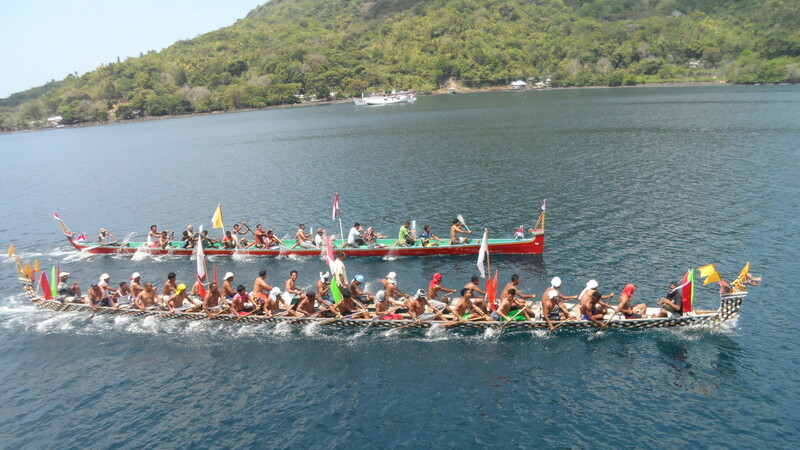 The first of the Banda Islands is Run. An amazing historical footnote is the fact that in 1667, under the Treaty of Breda, this small island was ceded by the English to the Dutch in exchange for Manhattan. After rounding Run we will reach the Island of Ai. Here we go ashore on a beautiful beach to meet with the villagers. A short walk brings us to Fort Revenge which was built by the English before being captured by the Dutch. Behind the fort we find the first nutmeg plantations. During lunch the captain will move us to the main island of Bandaneira. With the Ombak Putih moored in the bay, we will spend the afternoon strolling through the old town and get a feel for its incredible history viewing the restored planters’ mansions, fortifications and churches. We will find that Fort Belgica built by the Dutch East India Company (VOC) was an early blueprint of the Pentagon. Even today this island population is an interesting mix of Malay, Arab, Dutch and Melanesian. At the end of the day we will spend a quiet evening under the stars in the lagoon. In the course of the morning we cross over to visit Lonthor, the largest island in the chain. We visit the fortress Hollandia and the nutmeg plantation of the last perkenier,small land owner, on the island. By lunch-time we get back to the ship and in the afternoon there will be time to go snorkeling at the black lava stream caused by the eruption of Gunung Api. The morning is free to spend at leisure in Banda Neira. 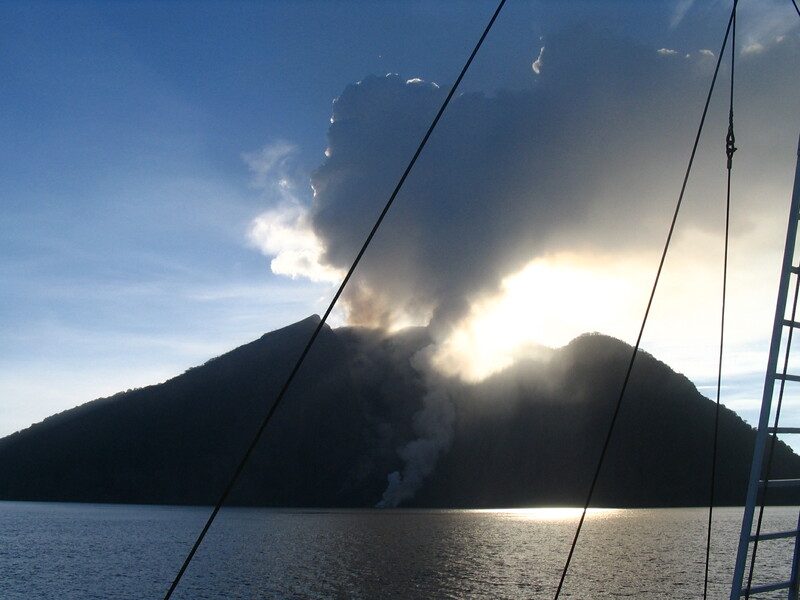 We invite the fit and ambitious to first come along for an early morning ascent of the Gunung Api volcano. 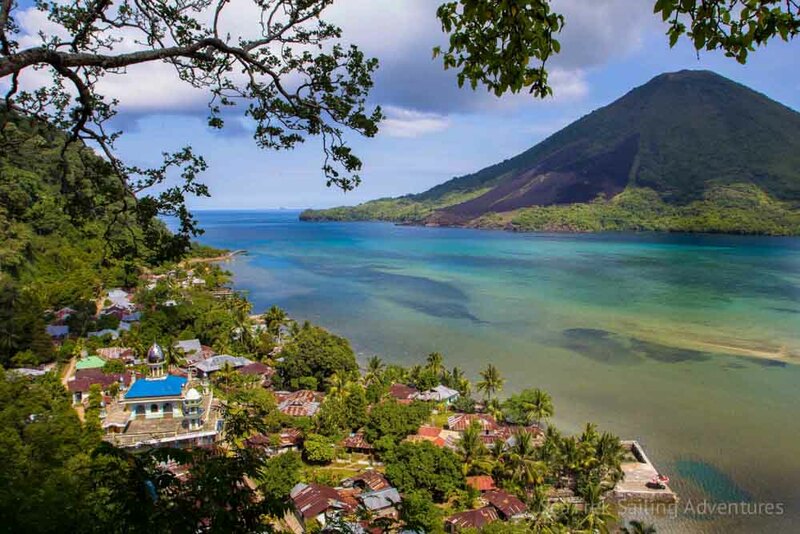 While this is a challenging climb up a narrow track to an elevation of about 600 meters the reward to reach the top of the “Fire Mountain” is more than worth it: a stunning and unforgettable view over the Banda Sea, the surrounding islands and the crater itself. On our way out the ‘Sonnegat’ (sun’s gap) between Bandanaira and Gunung Api we are often escorted by one or two ‘Kora-Kora’, long sea canoes, rowed by over a dozen muscled men and used in ancient times to attack the invading colonists. We arrive at the harbor on the island of Ambon. After breakfast, it’s time to say a final farewell to the crew and the Ombak Putih. Depending upon flight departure times we may have a morning program to see the town, the markets and a visit to the local museum, we then board a coach for our transfer to Ambon airport for the flight via Makassar to Denpasar. Ian Burnet’s latest book ‘Archipelago – A Journey Across Indonesia’ is now available. Please go to http://www.ianburnetbooks.com for a synopsis and book review. This entry was posted in Uncategorized and tagged alor, banda, dutch east indies, ian burnet, larantuka, nutmeg, ombak putih, seatrek, solor, spice islands. Bookmark the permalink.